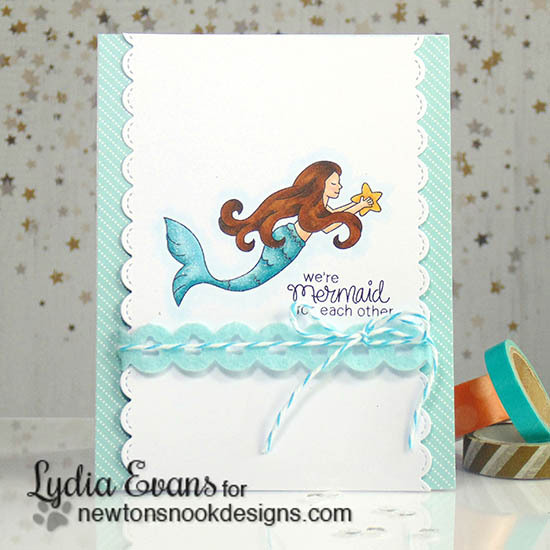 Today is our first reveal for our August Release and we are featuring the new Mermaid Crossing stamp set! We are giving the stamp set away to one lucky winner so make sure you read all the way to the bottom of this post to see how to win! 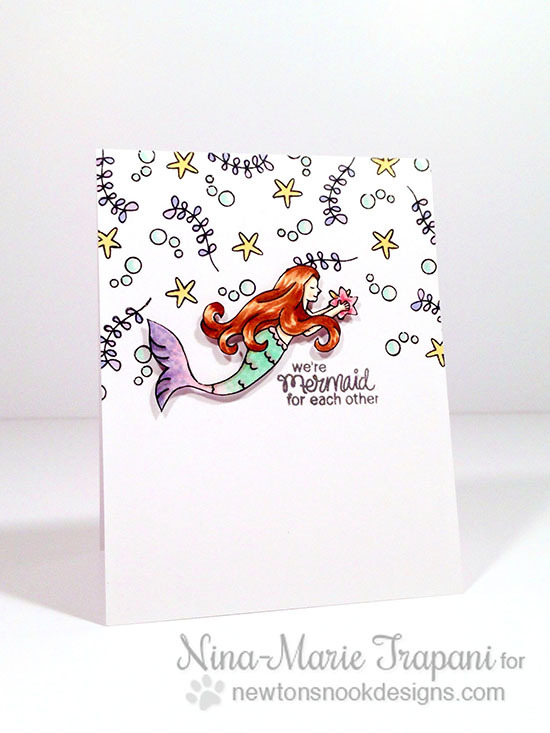 This 3x4 mini stamp set features sweet little mermaid images! 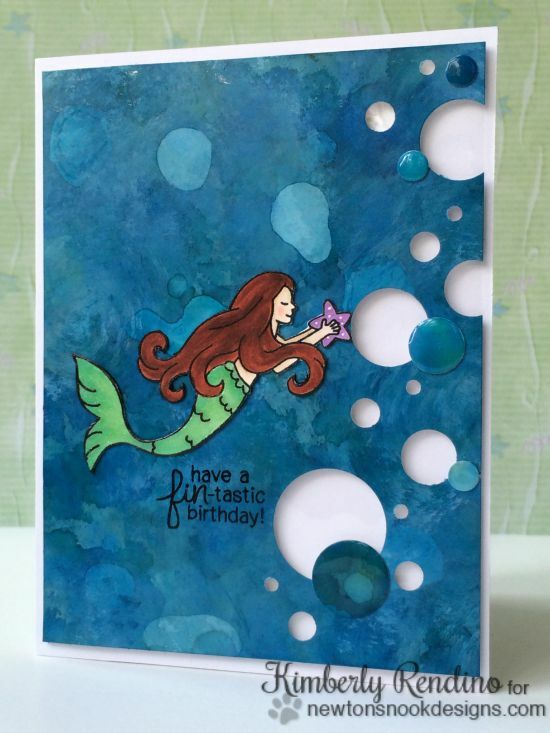 These lovely sea friends are perfect for sending “FIN-tastic” birthday wishes! 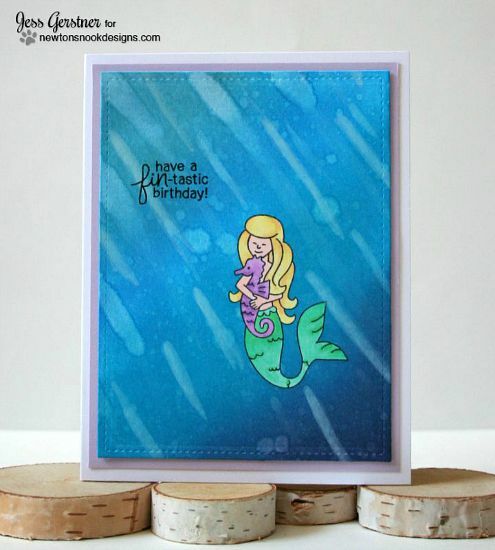 Use the mermaid hugging her seahorse friend with the “we’re MERMAID for each other” sentiment to create a unique anniversary or valentine card! First up we have this fun shaker card by our guest designer, Liz Munoz! If you look close inside the shaker you can see a tiny sneak peek of tomorrow's release too! Check out the fun background n this card by Samantha! So cool - and the mermaid is adorable too! 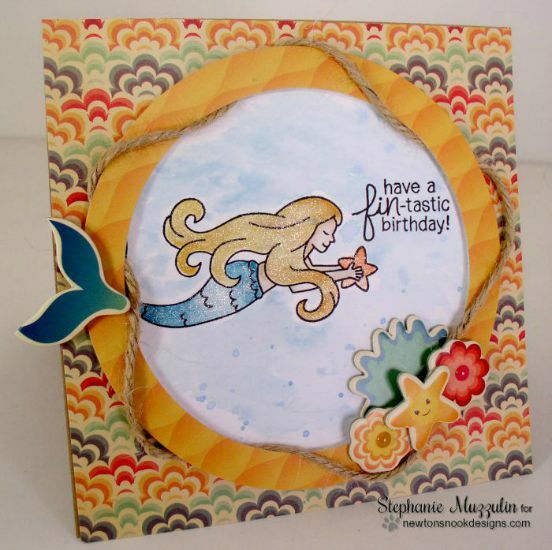 I love this gorgeous card by Stephanie! The added sparkle makes is so magical and I love how she stamped the tail! I love the fun background on this card by Jess! That cute mermaid looks like she's under the deep sea! 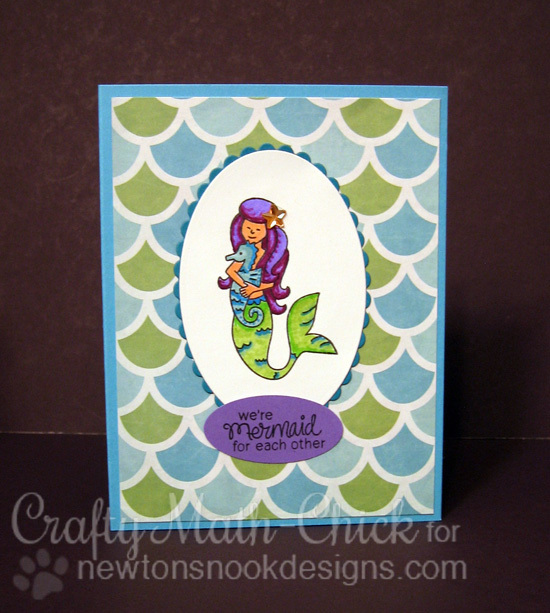 Here's a run card by Danielle - I love all the fun pattern prints that draw your eye into that cute mermaid! 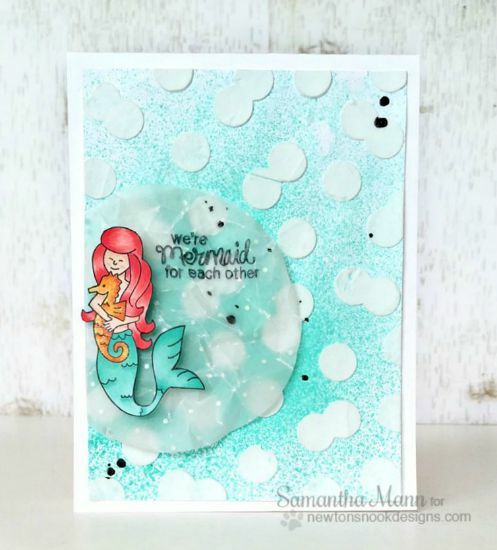 I love the fun bubble background that Kimberly created for her card - such a fun way to make it look like the mermaid is under the sea! Here is s super fun card by Crafty Math-Chick! She used a fun paper that looks like scales and I LOVE the purple hair on the Mermaid! So cool! I love all the sparkle on this card by Lydia. 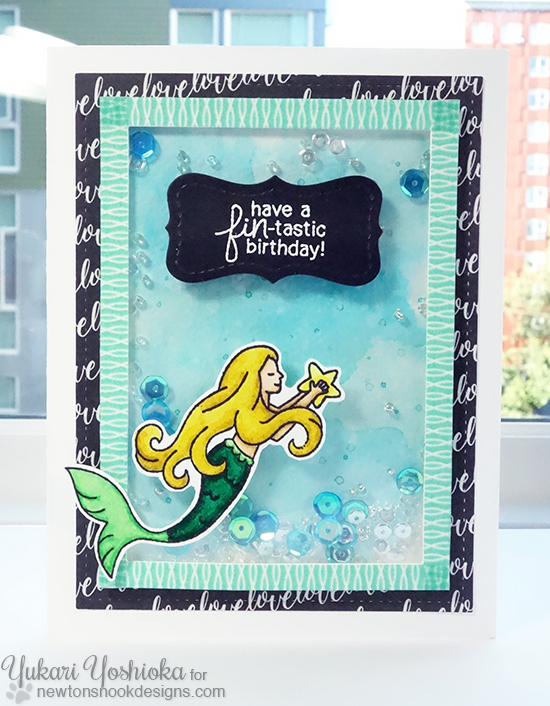 The sparkle on the tail and starfish really make it pop off the fun clean layout! 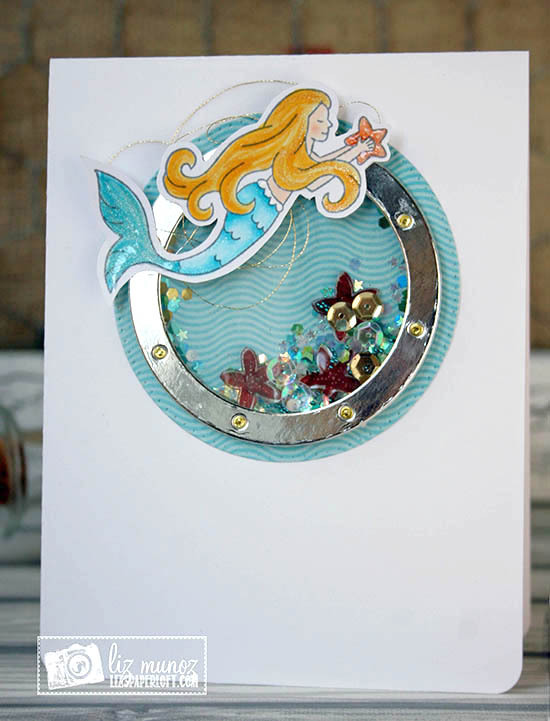 Larissa created a gorgeous jewelry pendant using the mermaid! It is so pretty with all that sparkle! Plus she created a card to put it on to give to the recipient! Such a cool presentation! This shaker card by Yukari is so pretty! I love the soft colors with the pop of black! What fun! 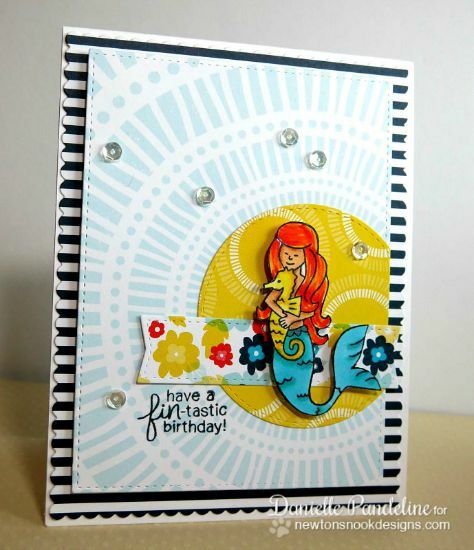 I love the fun clean and simple layout on this card by Nina-Marie! And the coloring on the mermaids hair is gorgeous! 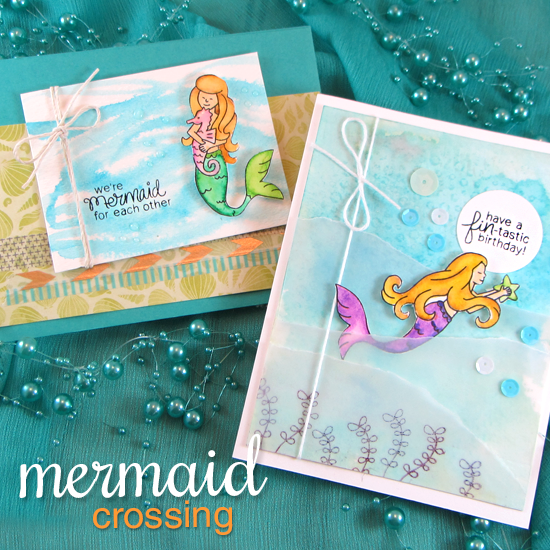 Would you like to win “Mermaid Crossing”? 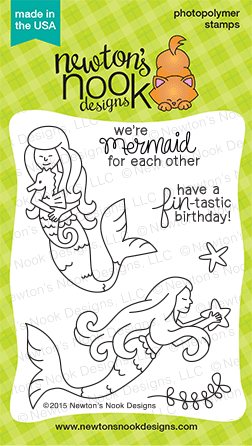 I am loving this new Mermaid stamp set!! What an adorable set! I love mermaids so this set has my name on it! This mermaid set is great!!! What a fun set!! So unique! Love everyone's designs! Love the mermaids. The cards were great. The DT did an excellent job. What a fun set! Love the mermaid hugging the seahorse and the 'mermaid for each other' sentiment!! Wow! Everyone's cards are amazing! Oh, I love this stamp! Thanks for the chance to win it. 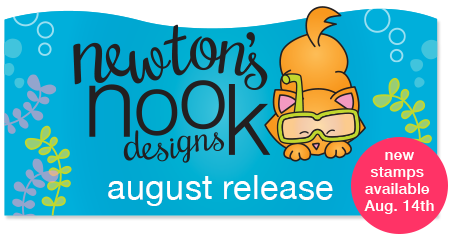 Newton's Nook is quickly becoming one of my FAVORITE stamp companies. Super cute set with great sentiments! Goodness! Pure Goodness! All of the cards are amazing! I love mermaids, and those mermaids are so beautiful! AWE This set is really cute!!! I love mermaid stamp sets!!! Would LOVE to win this Fintastic set!!! I really LOVE the sentiments in the set too!!!! Love the sentiments so much and the design team interpreted the little mermaid so well!!! These are some classy and excellent cards!! Some have many details and some are more simple but all of them are well done!!! I have never heard of these stamps! I like...alot!! Oh how my granddaughter would love for me to use this set! Hope I win! Seriously amazing inspiration! 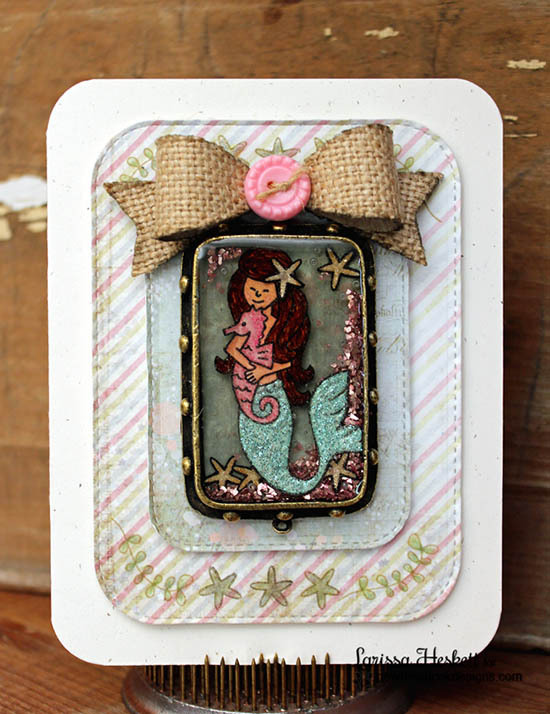 I LOVE the stamp set...the mermaid is so stinken cute and so many fabulous idea's and creations that brought this mermaid to life! What a fun stamp set and great cards. My 2 daughters and I love this stamp set! When you showed the tail in the sneak peaks, we were hoping for a mermaid set. Thanks! All of these cards are so pretty, and colorful. Thanks so much for sharing. Wonderful stamp set. What a beautiful mermaid stamp set. I need to get this as my daughter loves mermaids. So fun! I am so excited for this release. More, more, more please! Such pretty cards! Loving all the mermaid card samples!